How do I enter ACN in Reckon One? I want to enter my ACN in Reckon One but I cannot find anywhere to enter it. I do not have ABN and have ACN how can I record it? Currently, Reckon One does not have a dedicated field for entering ACN within. There is a field for entering ABN, however, this field will only accept a valid ABN and throws an error if ACN is recorded in, as it is not valid ABN. Option 1: Enable the custom text field and enter the ACN in it. 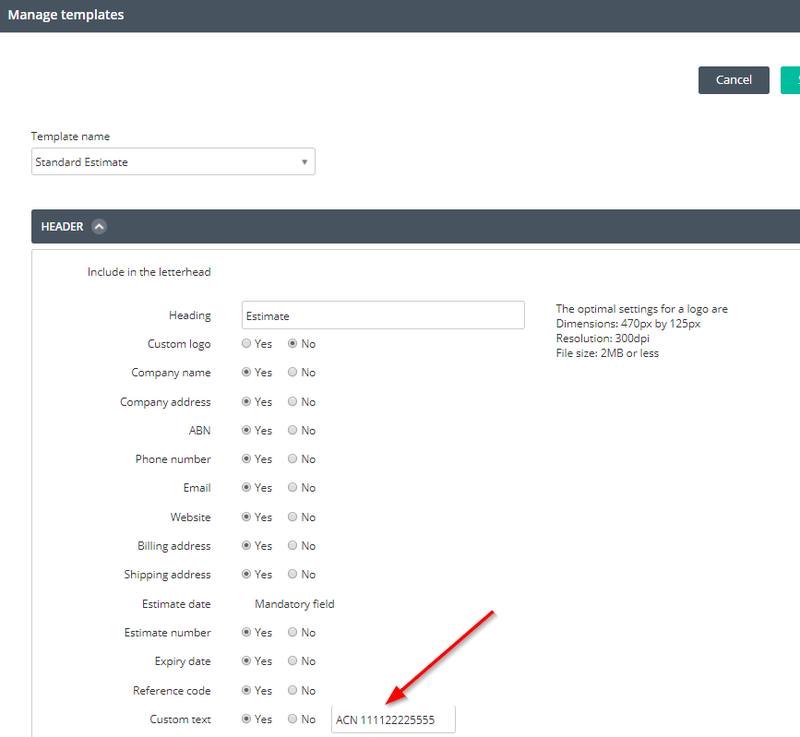 You can use the ‘Custom text’ field available in all the templates for Invoices and Estimates, to enter your ACN. The ‘custom text’ field is available in Invoices and Estimates area only and is a static field, meaning whatever you enter here will be displayed as is, in the header area of your Invoices/Estimates. 1) Login to your book and navigate to Administration (cog wheel) icon and settings. 2) Navigate to Day to day and Money in. 3) Go to Estimates / Invoices and Manage templates. 5) Scroll down to the Custom text field. 8) Repeat the process for another template if you have. Option 2: Please enter the ACN in the payment details in the invoice templates or other templates where you wish it to appear such as Estimates, Statements. Etc. this is useful if you have already used up the Custom text field for any other purposes. 1) Go to Administrations icon (cog wheel) on top right of the page. 2) Navigate to Day to day and select Money in. 3) Navigate to Invoices and enter your ACN under Payment details section. Do the same for estimates or statements area.